The Illinois Valley is known for it's strong Polish and German heritage, so why not channel that into a crowd pleasing dish? 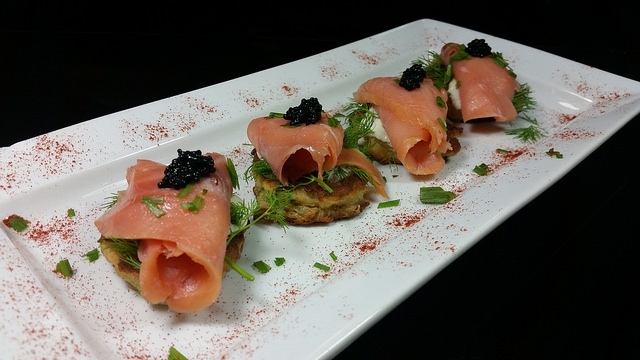 Our cooks are at it again and have created housemade potato latkes topped with smoked salmon, lemon mascarpone, fresh dill, and just a hint of caviar on top. Latkes are a very simple version of pancakes made with three basic ingredients of potato, eggs, and flour. Latkes were traditionally a Jewish favorite during Hanukkah, but grew increasingly popular amongst other European countries after WWII It's what comes on top that makes these a popular dish around Europe, and boy have we gone overboard on this one. The beginning layer of mascarpone cheese is a substitute to the ever popular version of cream cheese, and then topped with smoked salmon. Mascarpone is a smoother, lighter, and creamier version of cream cheese, but we mix it with fresh lemon. We then place a sprig of dill and some freshly sliced scallion on top of it all for a tangy-well rounded finish to the savory and smokey underlying flavors. While this combination is typically found in a breakfast style setting on a bagel or english muffin, we feel that this is best suited as an appetizer leading in to your main course. Either way, for all you Polish descendants out there, we're sure we did your ancestors proud with this one.